KEEP OUT OF REACH OF CHILDREN. Do not use if pregnant or nursing. Consult a health care practitioner or medical doctor prior to use if you are under 18 years of age. Consult a health care practitioner or medical doctor prior to use if you have a kidney disorder, or any other known medical condition, or if you are taking any over-the-counter (OTC) or prescription medication(s). May result in weight gain. Ensure to drink enough fluid before, during and after exercise. Store in a cool, dry place. 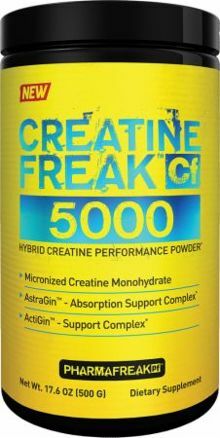 Why Use Creatine Freak 5000? ActiGin combines the strength of two powerful compounds: tienchi ginseng, a highly fractionated form of Panax notoginseng, and chestnut rose, which is known for its super-concentrated content of vitamin C, superoxide dismutase and other powerful antioxidants.